Louisville, KY (April 21, 2015) – For the first time since June 2013, the average price of retail food items across the Commonwealth decreased. 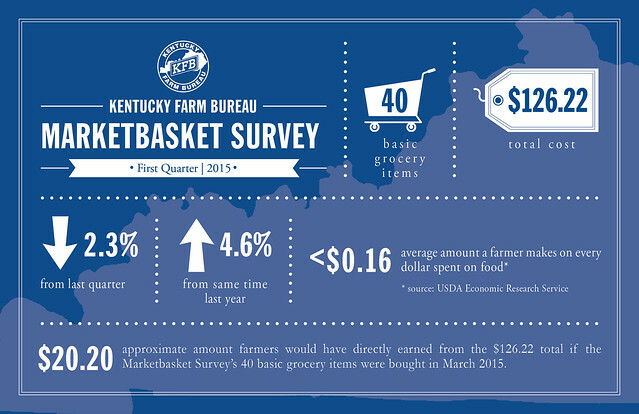 According to the Kentucky Farm Bureau (KFB) Federation’s latest Marketbasket Survey, taken in March of this year, the average total cost of 40 basic grocery items was $126.22, or 2.3 percent lower than what was reported in the previous quarter. This long-awaited price decrease broke a string seven consecutive quarters of increasing totals reported in KFB’s Marketbasket Survey, but is still 4.6 percent higher than the total reported at the same time last year. Food price averages at the national level, according to the U.S. Department of Labor’s Bureau of Labor Statistics’ most recent Consumer Price Index (CPI) data, also reflected an overall decrease this month. The CPI shows food-at-home prices falling by 0.5 percent in its last report (March 2015). This 0.5 percent drop was also the largest single-month decline in the food-at-home index since April 2009. Overall, however, the CPI data shows that national prices for food-at-home increased by an overall total of 1.9 percent during the past 12 months. The USDA’s Economic Research Service (ERS) predicts a steadying effect on food prices for the remainder of 2015 (based on the assumption of normal weather conditions). Food-at-home cost increases are forecast by the ERS to keep pace with, or end up slightly below, average food price inflation and are expected to increase by 2.0 to 3.0 percent overall this year. In KFB’s first quarter Marketbasket Survey, the overall trend of decreasing prices was heavily led by dairy products. Of the survey’s six food groups – beef, pork, poultry, dairy, grains, and fruits and vegetables – five categories reported reductions in average price, but dairy showed the greatest total reduction in cost with an average price drop of 7.8 percent (-$2.07). Beef, the only category with an average price continuing to climb this quarter, reached a new all-time high in the Marketbasket Survey’s history ($37.50 for five beef items). Overall, 26 of the 40 items recorded in this survey experienced decreases in average price during the first quarter. 2% Milk $3.62 / gal. $3.15 / gal. -$0.47 / gal. Ice Cream $3.97 / 1/2-gal. $3.51 / 1/2-gal. -$0.46 / 1/2-gal. Whole Milk $3.65 / gal. $3.26 / gal. -$0.39 / gal. Kentucky Farm Bureau Federation has conducted its regional Marketbasket Survey over the past four decades as a tool to reflect local retail food pricing trends and their relationship to what farmers receive for their raw commodities. Cities reporting on the Kentucky Farm Bureau Marketbasket Survey for the first quarter of 2015 include: Alexandria, Augusta, Barbourville, Bardstown, Berea, Bowling Green, Brownsville, Clinton, Cold Springs, Cynthiana, Eddyville, Elkton, Glasgow, Grayson, Harrodsburg, Hartford, Hopkinsville, Lexington, Liberty, Louisa, Madisonville, Mayfield, McKee, Mt. Olivet, Munfordville, Murray, Owensboro, Owenton, Owingsville, Powderly, Richmond, Russellville, Salyersville, Somerset, South Shore, Stanford, Tollesboro and Walton.